Conservation Status (International): IUCN status (international) Least Concern, ver 3.1. Definition (This species has an extremely large range, the population trend increasing). Conservation Status (national): National status in the Georgian Red List (2006) VU (D1): (Population size estimated to number fewer than 200 – 225 mature individuals, living on the edge of its global range). Economic importance (national): Currently absent. Potentially it is attracting for tourists in villages in Javakheti. Loved bird in southern Georgia. Ongoing research: Regular counts executed ones in four years (Institute of Zoology, Ilia State University, contact – A. Abuladze). 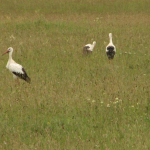 Specific relevant information: White Stork in Georgia is considered as a rare migratory breeder, with limited breeding range. During breeding season species occurs only in Southern Georgia - at the Javakheti Upland (Abuladze, 1987; Abuladze et al., 1986; Abuladze & Eligulashvili, 1986; Kutubidze, 1985; Zhordania, 1962). The breeding area covers Akhalkalaki and Gomareti lowlands, Tzalka hollow, slopes of the Abul-Samsari and Javakhethi ridges. All known nests are located between 1250 - 2400 m a.s.l. 50-70 breeding pairs. Why to monitor: Species rare and important for conservation. Flagship species for Southern Georgia. Small breeding area. 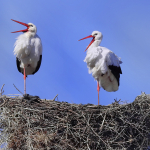 Very specific nest-sites selection – White Stork nests almost only in human settlements. Good visibility of the nests. All nests are known for local inhabitants. Easy and cheap to monitor. Data on the numbers available from previous decades. Preliminary suggestion: rely on the regular censuses of this species. კონსერვაციული სტატუსი (საერთაშორისო): IUCN სტატუსი (საერთაშორისო) Least Concern, ver 3.1. განმარტება: ძალიან დიდი არეალი, შემცირება არ აღინიშნება. კონსერვაციული სტატუსი (ეროვნული): საქართველოს წითეწლი ნუსხა (2006), VU (D1): (პოპულაციის ზომა 200-225 ზრდასრულ ინდივიდზე ნაკლებია, პოპულაცია გლობალური არეალის პერიფერიაზეა განლაგებული. ეკონომიკური მნიშვნელობა (ეროვნული): ამჟამად უმნიშვნელოა. საინტერესო ფრინველებზე დამკვირვებელი ტურისტებისთვის. სიმპატიით სარგებლობს მოსახლეობაში. მონიტორინგის მეთოდები: სოფლებში ბუდეების თვლა. მიმდინარე კვლევები საქართველოში: რეგულარულ აღრიცხვებს ატარებს ილიას უნივერსიტეტის ზოოლოგიის ინსტიტუტი, საკონტაქტო პირი - ა. აბულაძე. სპეციფიკური ინფორმაცია: საქართველოში იშვიათი მობუდარი, გადამფრენი სახეობაა, შეზღუდული არეალის მქონე. ბუდობა მხოლოდ სამხრეთ საქართველოში - ჯავახეთში (Abuladze, 1987; Abuladze et al., 1986; Abuladze & Eligulashvili, 1986; Kutubidze, 1985; Zhordania, 1962). ბუდობები ახალქალაქის და გომარეთის ვაკეზე, წალკის პლატოზე, აბულის და ჯახახეთის ქედების ფერდობებზე. ბუდეები განლაგებულია ზღვის დონიდან 1250-2400 მ-ზე. ყოველწლიურად 50-70 წყვილია შემჩნეული. რატომაა საჭირო მონიტორინგი: იშვიათი სახეობაა, სამხრეთ საქართველოში კულტურული მნიშვნელობა აქვს. მცირე საბუდარი არეალი. სპეციფიური ბუდობის ადგილები (თითქმის მხოლოდ სოფლებში). ადვილად დასათვლელი ბუდეები. მონიტორინგი ადვილია. წინა წლების ინფორმაცია ბუდეების რიცხვის შესახებ ხელმისაწვდომია (იხილეთ ბიბლიოგრაფია). წინადადება: რეგულარული თვლები, ინფორმაციის დაგროვება მონაცემთა ბაზაში. BirdLife International 2012. Ciconia ciconia. In: IUCN 2012. IUCN Red List of Threatened Species. Version 2012.2. <www.iucnredlist.org>. 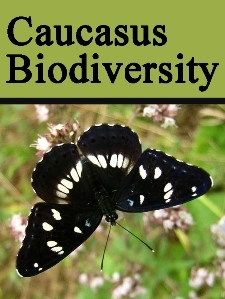 Downloaded on 19 May 2013 http://www.iucnredlist.org/details/106003835/0 . Абуладзе А.В., Элигулашвили В.Е. Белый аист (Ciconia ciconia L.) в Грузии Сообщения АН ГССР 1986 124/2 417-420 598.2 (Abuladze, A.V, Eligulashvili, V.E. 1986. The White Stork (Ciconia ciconia L.) in Georgia. Bull. of Acad. of Sci. of Georgia, 124, 2: pp. 417-420 (in Russian, summary in English)). Abuladze A., Kandaurov A., Eligulashvili V., Edisherashvili G. 1986. The Status of the Storks in Georgia. - Study of Birds of the USSR / 1st Cong. of Orn. Soc. of the USSR and 9th All-Union Orn. Conf. Abstracts, 1: pp. 19-20 (in Russian). Abuladze, A. 1987. laklaki saqarthveloshi [White Stork in Georgia]. Sakartvelos Buneba, 5: p. 21 (In Georgian). Kutubize, M. 1985. The Guide of Birds of Georgia. Tbilisi: 648 pp. (in Georgian). Lebedeva, M.I. 1960. 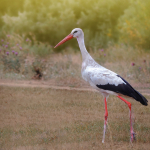 On the numbers of White Stork in USSR. Ornitologija, 3. Moscow: 413-419 (in Russian). Lebedeva, M.I. 1975. White Stork in USSR. Materials of the All-Union Conference on birds migrations, Moscow: (in Russian). Zhordania, R.G. 1962. The Ornithofauna of Lesser Caucasia (within limits of Georgia). Tbilisi: 288 pp. (in Russian).